Mama Love: Luna B. Review & Giveaway!! I just love all things personalized, must be the Southern girl in me, you know us southern girls love our initials on everything! And I absolutely love dressing my children, especially my girls, in personalized clothing. I’m always on the look out for a great new places to find clothing for them( and share with you lovely readers), so of course I was super excited to discover the Luna B Tee! 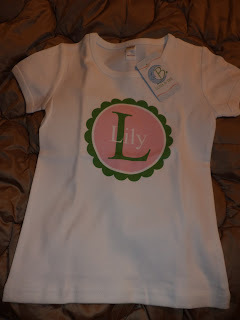 I was sent an absolutely adorable tee for my oldest daughter, Lily! 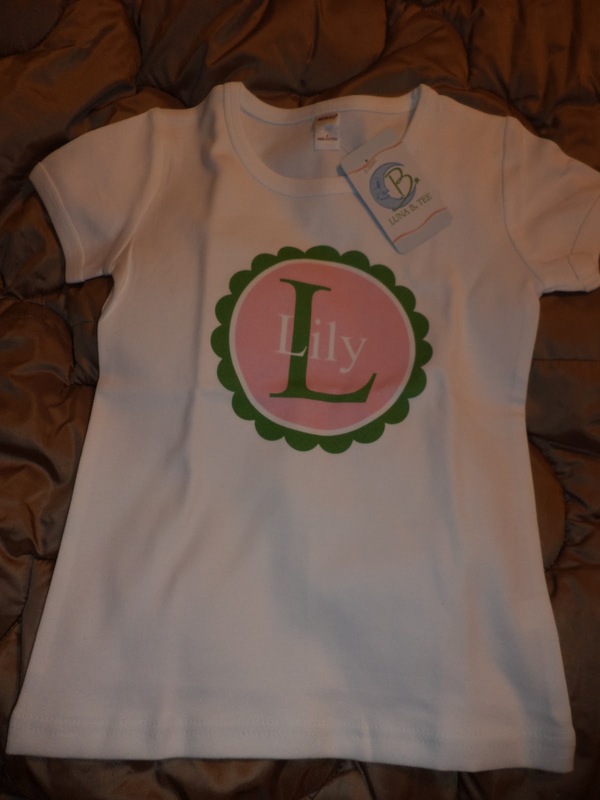 This tee is The Scallop and can be customized for a boy or a girl! And there are so many options to make this shirt your own how you want it "written" (capitalized not capitalized etc), So many color combos, short sleeved long sleeved any size you can think of, girly styled tees, classic tees, onesies, and so on! So you can truly personalize this to your taste, which I love! 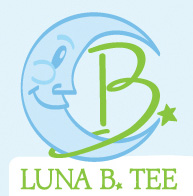 Luna B also has many many more products to choose from, name tees, sibling tees, holiday tees, school tees, adult shirts, dog tees, doll shirts, birthday items, baby gifts, dresses, and so much more you name it and I'm pretty sure that Luna B can make it! Oh and I just love their Personalized Gifts section. You will find everything from Mugs to pillow cases, to phone cases that of course can all be customized! 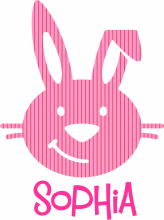 Look at this cute Personalized Bunny Shirt, This would be so perfect for Easter, and it comes in Pink and Blue! My kids love this design! Follow the form below for your chance to win! Maybe a peace, love, ... shirt. Cute! for some reason it wont let me click the entry thing any tips? are you logged into FB or Email? I like the Personalized Apple Shirt. Thanks for the chance to win! I would pick the Mouse Ears Shirt- The Texan. I would pick the scallop with my daughters name. Probably the lion tee from the heads and tails collection for my baby due in Aug. I like the ladybug shirt. Can't decide...too many cute things! Either the Mouse Ears Shirt - The Texan or the Mouse Ears with Bow! us something infoгmatіve to read?